Home >> Rants & Raves >> I’m in charge of the warm. I’m in charge of the warm. When my husband and I first started living together we had some growing pains like every couple. We had a problem that seemed small, but if it wasn’t fixed I feared it would doom us. I really like to be warm, and he didn’t mind so much being cold. I minded very much being cold. I have no idea why someone who hates the cold so much was born in Boston. Why that same person stayed here after being raised in this arctic tundra. And why after traveling the world following the sun that same person decided to settle here. It’s COLD from October until April. Ok that might be an exaggeration. It’s not like that every year, but that’s how it felt this year anyway. I digress. For the first year of our marriage there were lots of discussions about the temperature – the thermostat wars. In order to keep the peace we solved this problem simply. These days it’s even easier because this little brilliant piece of engineering, the Nest , has gotten to know us so well that sometimes we don’t even need to touch it for days! It knows when we’re away. We can control it from our phones. Awesome. Our 130 year old house has no idea what hit it. Now if I could only get him to be in charge of his dirty socks, that, would be great. Maybe there’s an app for that. A girl can dream. 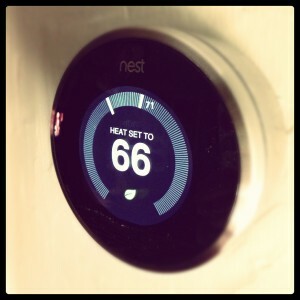 How do you keep from having the thermostat wars? How do you like to warm up when you’re cold?